This stunning newly remodeled home sleeps up to 12 guests and is close to resort amenities like a pool, hot tub, and sauna. Everyone will have a blast at Black Butte Ranch. Views of the Meadow Golf Course's eighth hole can be seen right from your temporary home. 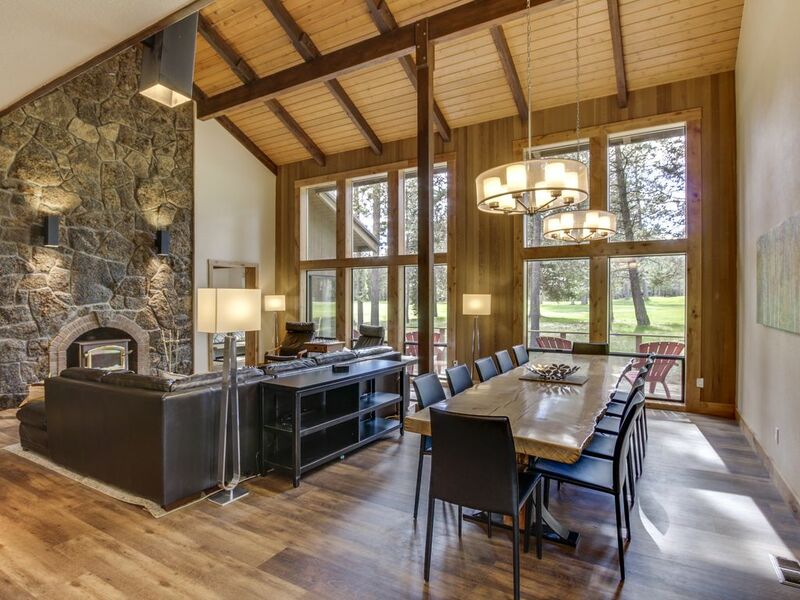 Walk to the main area of gorgeous Black Butte Ranch to swim in the pool, soak in the hot tub and sauna, eat at the bistro, and play at the activity center and tennis courts. Handicap-accessible on the main level, this inviting home is spacious and well-decorated to keep you in a constant state of relaxation. After a fun-filled day around the ranch, kick your feet up on the leather sofa to warm yourself by the fireplace, watch a movie on the flatscreen TV, and use the WiFi to stream music. The adjacent kitchen features a pristine space with major and small appliances to whip up delicious culinary creations for the entire group, which can be enjoyed inside at the dining table for 10 or outside on the beautiful deck. A bedroom and full bathroom on the main level give those who don't want to use stairs a wonderful place to sleep. There are also three other bedrooms and a loft available (three king-size beds, four twin beds, and a brand new queen air mattress in total), giving up to 10 guests beds to sleep in. There's plenty of space for sleeping bags as well! Two more full bathrooms mean no waiting in line for a shower, and the washer and dryer give peace of mind and a fresh outfit each day. Take a spin in a canoe or kayak out on the lake, or play a game of doubles on the tennis courts in Black Butte Ranch. Book a serene horseback ride through this wonderful, wooded area, or hike around to explore by foot. Try paddleboarding, swim in the pool, and play basketball. Reserve a tee time at either of the golf courses in the summer, and when snow is covering the ground, drive 15 miles to Hoodoo for skiing! Black Butte Ranch is the perfect place for your next family reunion, so book this immaculate cabin now! *At check-in, please be aware that the resort will collect a $9 daily fee for every guest 7 years and older for access. Parking Notes: There is available parking for 4 vehicles. Dock Details: The main resort lake offers a small dock. This house had just about anything you’d want to host and large party. It would be great for holiday gatherings. It is fully stocked, easy walk to main lodge and pool, Roberts Pub and golf. Loved the open floorplan and the table that seats twelve plus a great kitchen with loads of dishes an utensils. This home is also in a great location for many Ranch amenities. Good Wi-Fi, also. The location to Big Meadow and the lodge was great. That said it should have been made clear that this house was across from the utility yard and at times there were some strong odors. Also a few of the beds weren’t as comfortable as they should have given the price of this unit. We wanted a house with lots of windows and a great deck and weren't disappointed even if the deck needed maintenance and staining. The one big improvement for this house would be a hot tub. We apologize if there were some disappointments with this stay. We have inspected the knives and advised the owners of the comments regarding the deck. Due to multiple mishaps with children and curtains in the bunk bed room, the owner has decided not to replace the curtains. Thanks! Lovely house. Be forewarned that the four bunkbeds are very close, clearly meant for children. Sound carries and is amplified as it rises to the second floor.